Kobra 400 HS6 high security shredder is suitable for use between 1-5 people. 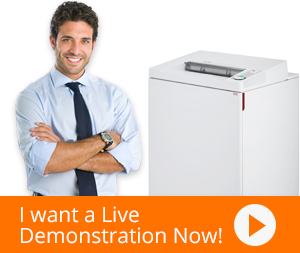 It is a level 6 security shredder suitable for shredding the most confidential documents. It is TAA compliant; suitable for use with government funds. Kobra 400 HS6 automatically oils the cutting blades; increasing the blade’s life, it is an energy smart shredder and saves electricity by automatically going into sleep mode after a few minutes of non-activity. It features a heavy-duty chain drive system that enables it to shred through the toughest of jobs. It has thermal protection system that prevents the shredder from heating up and enables it to shred continuously.